HAYWARD, Calif., Aug. 7, 2015 (SEND2PRESS NEWSWIRE) — Sixteen members of the elite Air Force One Detailing Team led by Master automotive and aircraft detailer, Renny Doyle of Detailing Success and the Detail Mafia, has partnered with Bob Phillips, president of P&S Sales, an innovative professional detailing product manufacturer and distributor, to be the exclusive detailers and detailing product providers at the 24th Annual Gordon McCall Motorworks Revival Event. Held on Wednesday, August 12 at Monterey Jet Center in Monterey, proceeds from McCall’s “Luxury Lifestyle Bash” support the California Highway Patrol 11-99 Foundation. Over 3,500 of the most influential automotive collectors, car enthusiasts, celebrities, and automotive professionals in the world attend the posh event every year. Phillips (CD-SV, RT) is also a member of Doyle’s Detail Mafia, a select brotherhood of high-end professional detailers who specialize in the restoration, maintenance, and preservation of multi-million-dollar automobiles and aircraft. Many members of the team just returned in July from their decade-long preservation of the original Air Force One presidential jet at Seattle’s Museum of Flight. They also travel the U.S. restoring and preserving classic and exotic private collections, museum paragons, and community projects nationwide. Using exclusively P&S Detailing Products, on Tuesday and Wednesday, August 11-12, the team will begin by prepping an entire fleet of rare and exotic automobiles, private jets, and helicopters. The vehicles and the team’s talents will be showcased at McCall’s Official Kickoff Gala, Wednesday evening from 5 until 10 p.m. The elegant party marks the start of 2015 Monterey Car Week. On Thursday, August 13, the Detail Mafia and P&S Sales move out to the Monterey Peninsula where they will prep another fleet of vintage sports cars and creme de la creme luxury cars for Friday’s The Quail, A Motorsports Gathering at the Quail Lodge & Golf Club. The event’s global reputation made it a finalist in the Motoring Event of the Year category for the 2014 International Historic Motoring Awards. Again, the team’s unique paint correction and detailing talents will be as much on display as the cars themselves. On Saturday, August 15, the team heads over to the Rolex Monterey Motorsports Reunion where they will prep and maintain a selection from hundreds of race cars competing in the world’s premier motoring event, and the largest event of Monterey Classic Car Week. Only Master-level and mentored members of Doyle’s Detail Mafia have been selected for the events next week, and the products provided by P&S Sales are among the finest on the market today. 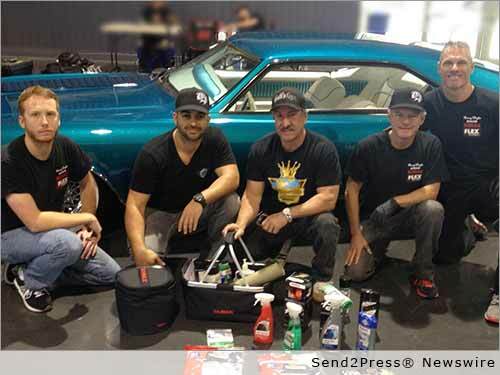 * Caption: Members of The Detail Mafia with P&S Sale’s Bob Phillips (far right). Original Keywords: Luxury Lifestyle Bash, 24th Annual Gordon McCall Motorworks Revival Event, Rolex Monterey Motorsports Reunion, Bob Phillips P and S Sales Hayward California HAYWARD, Calif.
REFERENCES: Automotive and Motorsports News, Luxury Lifestyle Bash, 24th Annual Gordon McCall Motorworks Revival Event, Rolex Monterey Motorsports Reunion, Bob Phillips P and S Sales Hayward California HAYWARD, Calif.